RIT took third place in last year’s Collegiate Pentesting Competition. Sixty of the nation’s top cybersecurity college students will face off this November at an offensive hacking competition in Rochester. But for these future data defenders, cybersecurity is more than just a game. After making their way through regional competitions in October, the top 10 college teams in the U.S. will now have the chance to use their offensive hacking skills for good at the national competition, which is sponsored by several top tech companies, including IBM Security as the premier sponsor. The National Collegiate Penetration Testing Competition (CPTC) will be held Nov. 3–5 at RIT’s B. Thomas Golisano College of Computing and Information Sciences. Teams will attempt to break into computer networks that were created for the competition, evaluate their weak points and offer plans to better secure them. The competition allows students to experience a day in the life of a penetration tester—the security professionals hired to test and evaluate an organization’s computer systems and networks to ensure that malicious hackers can’t get in. Judges and sponsors from the security industry will evaluate the performance of the competitors while under fire. Students will have the opportunity to meet experts and hand out résumés. Sponsors include IBM Security, Uber, Crow Horwath, Hurricane Labs, IEEE Cybersecurity Initiative, Eaton and Indeed. Outside of coursework, student competitors often spend a few nights during the week and most weekends practicing for the event. Practice includes, breaking into fabricated networks and computers, independent research and working on their technical writing. For Alex Lynch, a fourth-year computer science at University of Central Florida, organization is a significant factor in success at CPTC. 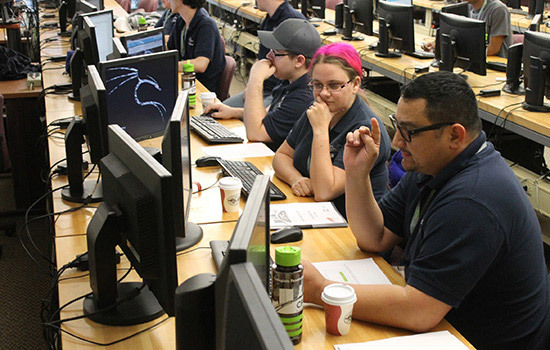 The Collegiate Penetration Testing Competition, now in its third year with nationals held in Rochester, is the premier offense-based computing security event. It is an effective counterpart to the Collegiate Cyber Defense Competition (CCDC)—with its national competition held annually in San Antonio—which is the premier defense-based event, requiring students to defend an infrastructure while performing typical business tasks. For more information on the Collegiate Penetration Testing Competition, go to nationalCPTC.org. RIT will host the National Collegiate Penetration Testing Competition Nov. 3–5 in the B. Thomas Golisano College of Computing and Information Sciences. Teams from the nation’s top 10 computing security universities will come to RIT to face-off in the offensive cybersecurity competition. WHEC-TV reports on the "ROC Game Dev Meetup" at RIT's MAGIC Spell Studios.